German sculptor and architect, active mainly in Berlin. Influenced by the Italian sculptors Michelangelo and Bernini, Schlter worked in carved stone, cast bronze, and stucco relief. 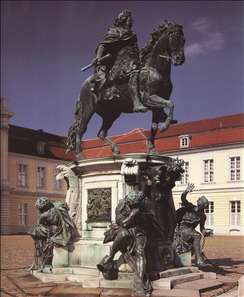 He was the leading Baroque sculptor in northern Germany, and his masterpiece is the splendid equestrian monument to the Great Elector Friedrich-Willem (Charlottenburg Castle, Berlin, 1696-1708). Schlter s most successful architectural work was the New Palace in Berlin (1706, destroyed in World War II). He fell under a cloud when some of his architectural work collapsed, and he moved to St Petersburg, where he died soon after arriving. See more details about "Prince Elector Frederick William the Great"